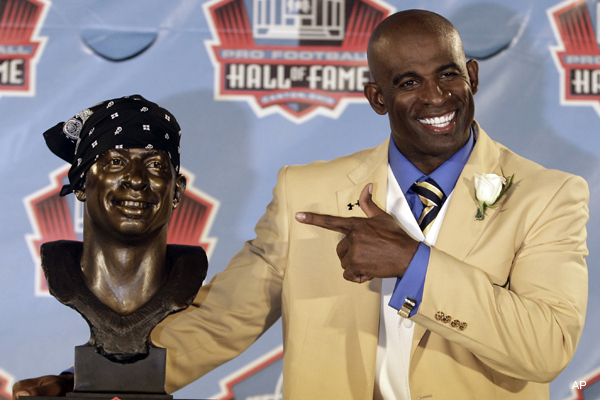 This weekend, arguably the most charismatic player to ever step foot on a National Football League field, Deion Sanders, was enshrined into the NFL Hall of Fame. Being inducted his first time being on the ballot, “Neon Deion” got the pat on the back he deserved as his talent and effort over his legendary career was recognized on the grandest stage. However, the man we fell in love with as “Prime Time” did not soak in the spotlight, but instead passed it on to his mother. The man who also played in the MLB is without a doubt one of, if not the greatest cornerback to ever play the game of football. But Deion gave all of the credit for his success to his mom. Sanders said that growing up he was ashamed that his mom had to work cleaning a hospital to pay the bills and to afford for him to play football. He spoke of being teased by other children whose parents had more high profile jobs and made more money. Deion vowed to be so successful at football that his mother would never have to work another day in her life. And Deion succeeded. Deion Sanders went from being one of the most flamboyant players in the league and the predecessor to players like Terrell Owens and Chad Ochocinco to being one of the most respected men in the league as he grew up and had a family. But after this weekend, whether he is known as “Neon Deion,” “Prime Time,” or just Deion Sanders, he is always going to be known as a Hall of Famer.